I made 2! 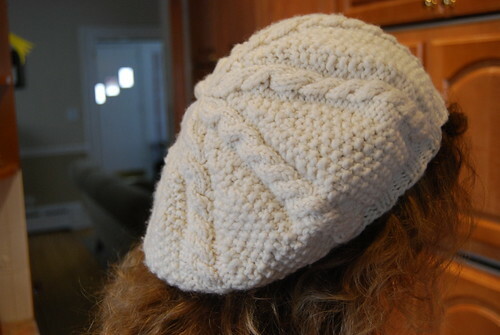 The first was too slouchy for dd#1 (Cascade 128 and US#7 dpns), so I kept it, and made her another with lighter yarn, smaller needles and less rounds, Lion Brand Woolease and US#5 addi 16" circs and dpns. I started this yesterday. I'm really enjoying it. I just finished mine. Done in Classic Elite Pima Cotton Tencel, icey blue, on #4 bamboo circs. 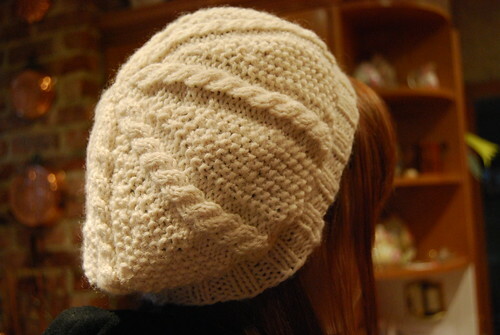 I really enjoyed it, and it taught me to pay better attention when you think you have an easy lace pattern! I decreased in the front and back before placing straps, and left the top as is rather than adding ribbing. 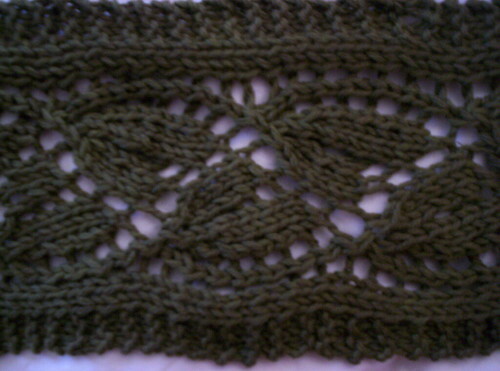 I thought I'd prefer the ribbing but ended up frogging it. I bound off tightly and between that and the decreasing, I have no real problems with the straps, except that they'll probably have to be shortened. 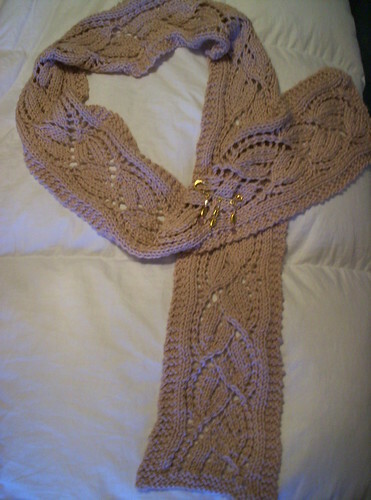 Come to http://donnac368.blogspot.com/2007/05/more-you-knit-more-you-learn-aka-razor.html to see more pics. Here's my Monkey in progress. Need to do 4 more heel rows and then pick up. The yarn is Wildfoote Handpaint Sock Yarn from Brown Sheep and the needles are the shorty Brittany birches size 1. I can see I might have trouble getting it over my heel as well but I know they'll stretch and I hate droopy socks. Two Dayflowers and a Liesel. These were gifts for my sisters and mom. I made the scarf pins for them too. I enjoyed the Dayflowers, but couldn't do three in a row, so I switched to the Liesel. It was a bit more challenging, but after a couple of repeats it went quickly. I enjoyed them all and now I am hooked on lace. By the way, I made some scarf pins (kilt pins actually) for each. The green scarf is done in Lambs Pride cotton and the pink one is done in Debbie Bliss Cashmerino (the Liesel is Cashmerino too). It's the one on the right, made from Debbie Bliss Cashmerino. 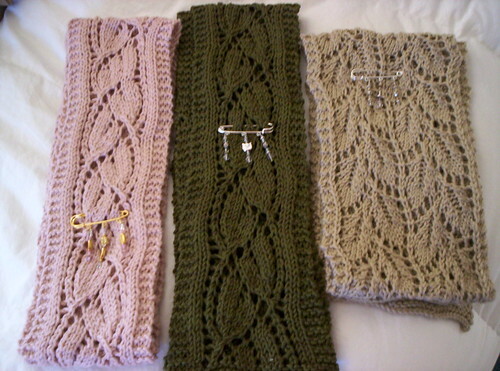 The other two are Dayflower Lace Scarves. Liesel is a bit more interesting to work on. I enjoyed it. I gave it to my older sister along with a handmade scarf pin. OK, let's have another try. After all, if I can knit a fake a gamo, I can surely upload some photos, right?